Happy New Year! Shanah Tova! 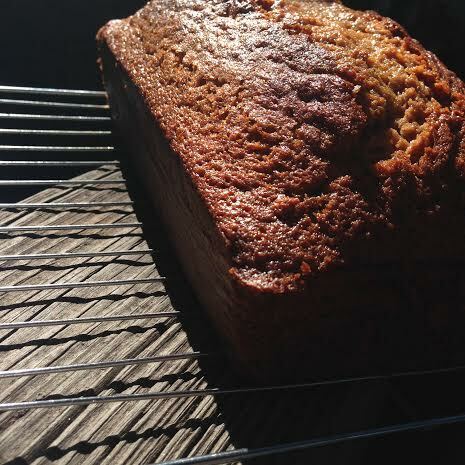 The solemn atonement of Yom Kippur has passed and now we can make that cake that we meant to make on Rosh Hashanah! This cake was devoured before I got the opportunity to take a picture of its inside, but believe me when I tell you that it is the MOISTEST CAKE I HAVE EVER MADE. I’m sorry to subject you to the word moist, but there’s really no synonym that can better describe this cake. I chose to replace the coffee in this recipe with some strong licorice spice tea (I am a licorice enthusiast). If you’ve ever been to an Aveda store, there’s a 99% chance that you have been offered this tea. It really enhances the honey’s amber sweetness. If you wanted to substitute some of the tea/coffee in this recipe for applesauce, that would be cool. It would make it a super Rosh Hashanah cake. Grease a loaf pan, line with parchment paper, and grease the paper. Preheat the oven to 350º fahrenheit. Whisk together all the dry ingredients, then make a well in the mixture and add the remaining ingredients. Combine the ingredients well, resulting in a thick-ish batter. Bake for 55 minutes (at the 40 minute mark the cake smelled like it was burning, but it had not yet set in the middle, so I covered it with some aluminum foil). 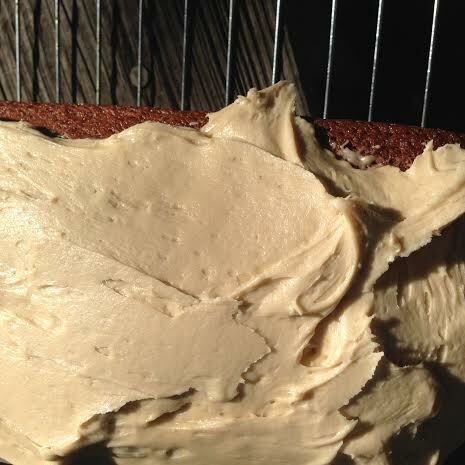 When finished, the cake should be dark brown, set in the middle (not jiggly) but not too hard, and springy. Cream the sugar and the butter with a stand mixer until well-combined. Add the cream cheese and beat until fluffy. If you want your buttercream to be more traditional, add the powdered sugar and continue to beat. If you’re happy with distinct cream cheese and brown sugar tastes, you can leave it, but I prefer adding the powdered sugar. I think that it aids to the marriage of the two flavors. 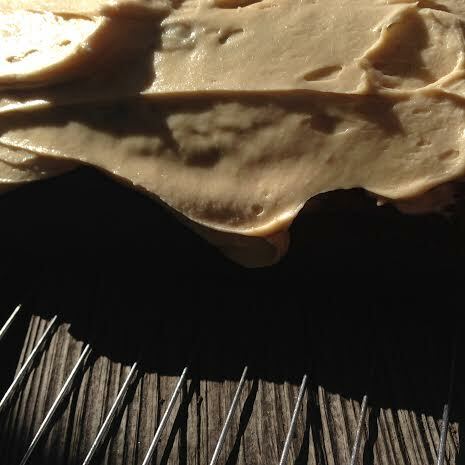 Once the cake has cooled, dollop on the frosting and spread over the top of the cake. I chose to leave the sides naked. Serve thick slices with a glass of milk or warm apple cider.